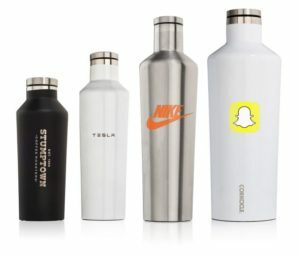 Custom logo Corkcicle tumblers are available in multiple colors you can mix and match for the best corporate and executive gifts. 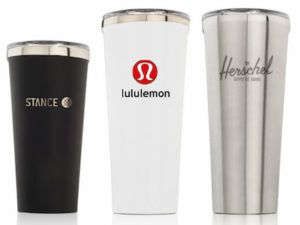 Better than typical promotional product quality, these tumblers keep drinks hot or cold all day and come in a variety of sizes and colors. I’ve tried a lot of them and Corkcicle is the best, outperforming every other brand, including Yeti. Custom Corkcicle tumbler in matte black, gloss riviera blue, gloss white and brushed steel. bottom, it’s worth holding and beholding. Easy grip sides. Once you’ve held one, you’ll know why. No slip, rubber grip bottom. ut head to head comparison test. Order Corkcicle tumblers online at my.CEOgolfshop.com or we’ll einvoice you link to click and pay. Choose a size: 16 oz ($24.95 per unit, delivered) or 24 oz ($29.95 per unit, delivered) with one color logo. Prices subject to change; contact for multi-color and multi-placement logos. Production typically 2-4 weeks; ask about expedited. Our permanent logo process varies depending on the color. What is cost to customize? 1 location free. What colors can I print? Provide us your PMS colors and we’ll do our best to match. Are there size limitations? Varies by product and size. If no preference provided, we’ll make the biggest that looks good in standard upper position. Can I mix and match canteen colors or sizes? Yes, increments of two, overall minimum must be met. What’s the lead time? It varies from weeks to months depending on seasons, manufacturing times etc. We recommend ordering in advance as far as possible. What’s the minimum order? 48 units. Sister company to CEOgolfshop.com, a 100% Women-owned Florida business since 2004. CEO promos specializes in quality custom products, including luxury men’s apparel. From private label to top luxury brands, we manufacture or source virtually anything executives and high net worth individuals need. CEOgolfshop is an authorized reseller of custom Corkcicle promotional products. 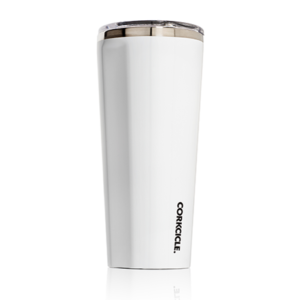 Corkcicle Tumblers use a first-of-its-kind, proprietary layer of insulation. In between the two walls of stainless steel, there’s a third layer that keep drinks cold for up to 20 percent longer than other insulated bottles and cups. They make a variety of exceptional products for your drinks including coffee, beer, wine, and accessories. Custom Corkcicle tumbler in matte black, gloss white and brushed steel. 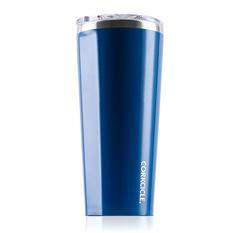 Corkcicle custom tumbler riviera blue example. 24oz gloss riviera blue tumbler, blank. 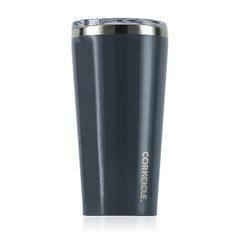 Corkcicle 16oz gloss graphite tumbler blank. Keeps stuff cold and hot – yes! See prior posts about head to head comparison test. Choose a size: 16 oz ($24.95 per unit, delivered) or 24 oz ($29.95 per unit, delivered) with one color logo. Prices subject to change; contact for multi-color and multi-placement logos. Click here to buy select items online. Custom logo Corkcicle tumblers and canteens in new colors graphite and blue are a great summertime, college student and executive gift. Better than typical promotional product quality, these tumblers keep drinks hot or cold all day and come in a variety of sizes and colors. I’ve tried a lot of them and Corkcicle is the best, outperforming every other brand by far. According to Corkcicle, the 60-oz Canteen holds a full pitcher, growler, two regular wine bottles or a magnum wine bottle. Two bottles of wine, or a magum is just over 50 oz, and most bars and restaurants use 48 or 60-ounce pitchers. The standard growler size is 64 oz, and the half growler, growing in popularity, is 32 oz. 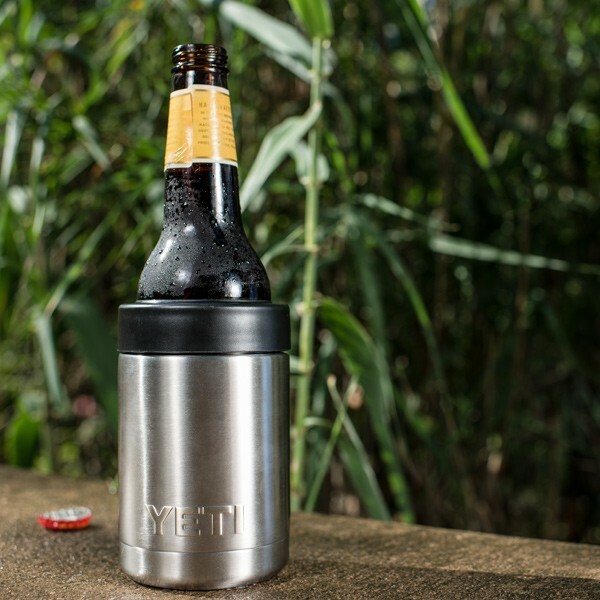 With proprietary triple insulation, they keep beverages cold for 25 hours or hot for 12 wherever you take it. Available in multiple colors and four sizes, including the 25oz which holds a standard bottle of wine. With proprietary triple insulation, they keep beverages cold for 25 hours or hot for 12 wherever you take it. Available in multiple colors and two sizes. Custom canteen photo courtesy of Corkcicle. 9, 16, 25, and 60 oz shown. unit is black, we can use a laser etch process to expose the stainless steel underneath. CEOgolfshop is an authorized reseller of custom Corkcicle promotional products. 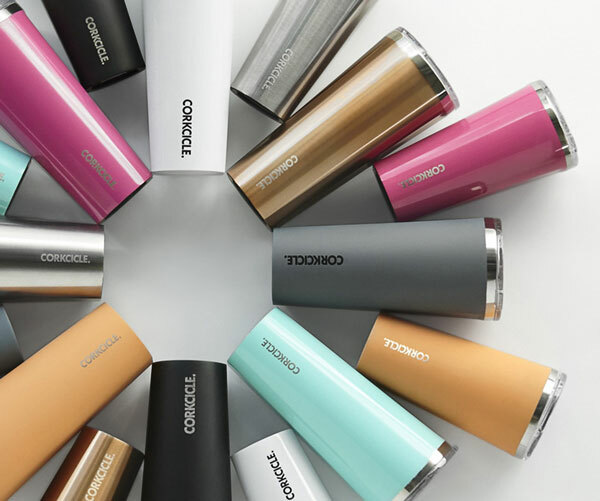 Corkcicle Canteens and Tumblers use a first-of-its-kind, proprietary layer of insulation. In between the two walls of stainless steel, there’s a third layer that keep drinks cold for up to 20 percent longer than other insulated bottles and cups. They make a variety of exceptional products for your drinks including coffee, beer, wine, and accessories. 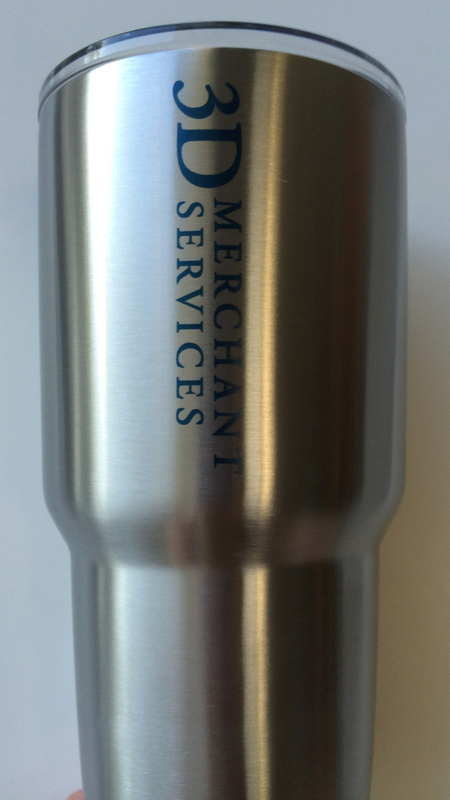 Custom logo Corkcicle Canteens are a great holiday executive gift. A past Oprah’s Favorite Things, the canteens keep drinks hot or cold year round and come in a variety of sizes and colors. With proprietary triple insulation, they keep beverages cold for 25 hours or hot for 12 wherever you take it. Available in 14 colors and four sizes, including the 25oz which holds a standard bottle of wine. l mostly live in warm, sunny South Florida, but I’ve spent most of this summer in New York where it’s been hotter than usual, with over 20 days above 90 degrees. I miss my Yeti. I miss my Corkcicle! I never drive anywhere without cold water in Florida so why would I want to in NY summers? Surprisingly, most people up here don’t have one. Looking for a great gift for someone in the Northeast? You just found it. I can pour a beer into it and it’s cold to the last drop. Spill proof lid. If you’ve ever had a Yeti, you know what I’m talking about. Easy grips on each side. I never knew how much I’d appreciate having them, until I used an old brand again that didn’t. I’m sure it costs more to manufacture, but I think it’s worth it. Sadly, color Corkcicle’s are rarely available for custom, but check back with us or request an advance order, 6-12 months, and we’ll do our best. Or you can choose from stock black, white, or stainless any time. Sister company to CEOgolfshop.com, a 100% Women-owned Florida business since 2004. CEO promos specializes in quality custom products, including luxury men’s apparel and one of a kind art gifts. From private label to top luxury brands, we manufacture or source virtually anything executives and high net worth individuals need. The custom logo Corkcicle Whiskey Wedge and custom logo Yeti Lowball are great ‘cold drink’ gift ideas, serving different markets. With different approaches to keeping spirits cold, as a gift item, they serve two different recipient types. The look of the product is completely different, and should be take into consideration when choosing as a gift item. 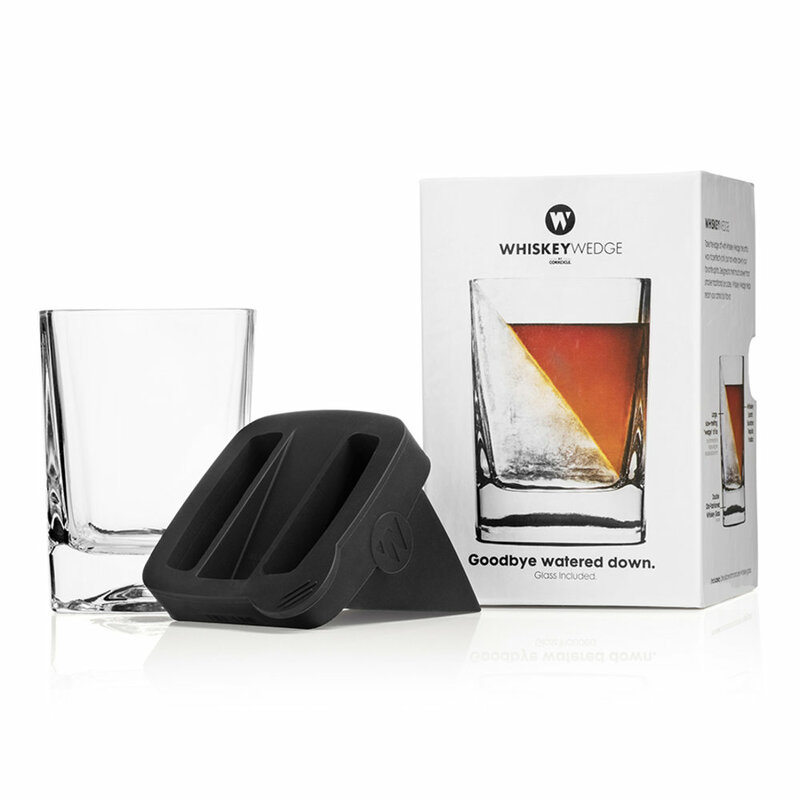 Because the Whiskey Wedge does not have dual use to keep liquids hots (they have other products for that), this review compares the two products only as a gift to keep drinks cold. Whiskey wedge with laser etched custom logo. The Yeti lowball is made of the same materials as their other Rambler series products, a highly polished stainless steel, and your company logo can be laser marked, typically black or a shade of grey for optimal results. The Whiskey Wedge is made of glass and your logo is laser etched. It’s easy to imagine the Whiskey Wedge in any indoor environment, from boardroom to dining room, and even on the patio. The lowball doesn’t have the same aesthetic panache; Yeti is made for the outdoors, and is the better choice for camping, boating and backyard pool areas, where glass is frowned upon and impractical. 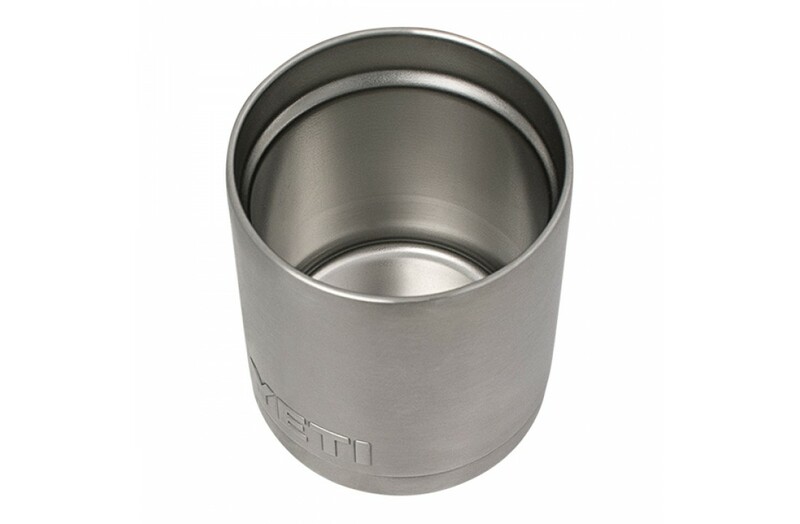 Yeti Rambler Lowball keeps cold drinks cold and hot drinks hot; lid is optional extra. Yeti relies on the double wall insulation to keep liquids cold, and eliminate outside sweat. 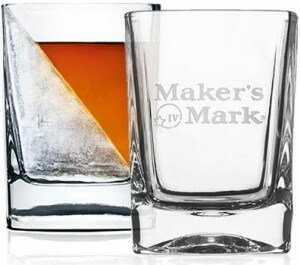 Add your ice, add your spirit, and the lowball will keep the ice from melting as fast as a standard cocktail glass. Corkcicle relies on the reduced ice surface to keep your drink cold and undiluted. Based on the technology, Yeti user will have some instant dilution of their spirit, while the wedge will produce a less diluted drink, at least in the short term, especially if being used indoors in a controlled temperature. With Yeti, just add drink, ice and go. With the Whiskey Wedge, plan ahead. $17.95 retail blank vs $24.99 retail blank. Customization costs are comparable for both products. Quantity discounts are available for Corkcicle, but not Yeti. Either would make a great executive or incentive gift; giving more than one is advised for senior executives so they can share a cold drink with their friends. Outdoor or indoor use is the great separator for which product is the best gift idea. Is the recipient an avid outdoorsmen into hunting, camping, fishing, boating etc? Or is the recipient more likely to use at home or work? Does the recipient drink bourbon, whiskey, scotch, vodka, tequila or even mixed drinks? If you live somewhere it gets hot, either will get used. The Yeti Colster is a custom logo gift with high return on investment for company branding. Your brand will always be associated with the great feeling of a cold drink on a hot day. Demand is very hot so don’t wait to contact CEOpromos for your custom logo Yeti Colster because inventory often disappears overnight with large corporate orders. What makes it special? The exterior touch matches the outside temperature but the inside stays as chilled as the drink you put in it for hours and hours. Plus, it doesn’t sweat. The top cap hides what exactly is in that can you’re drinking! Pre-chilling the Colster is optional. It works even without it. Not all bottles will fit the Yeti Colster well, but most do. 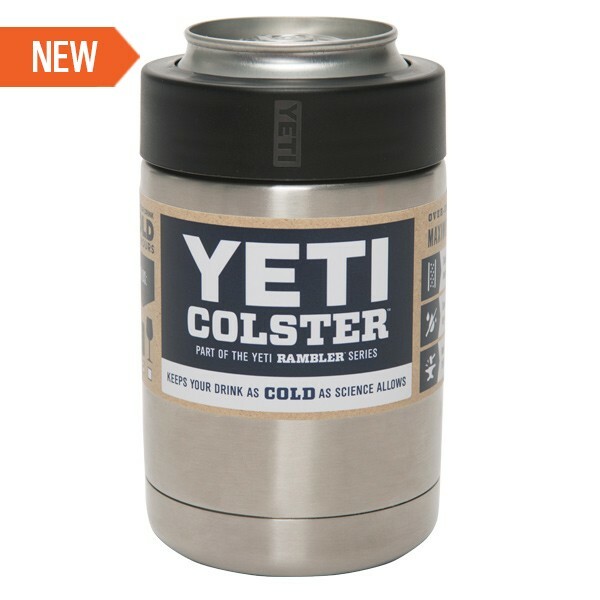 The YETI Colster™, is part of the Rambler™ series, the next evolution in can-insulating, hand-protecting technology. All the powers of modern science were brought to bear on this drink insulator to keep the contents of your 12 oz can or bottle chilled, including double-wall vacuum insulation and a ThermoLock™ Gasket that locks in the cold. The heavy-duty stainless steel walls are sweat-proof, so you can high-five with impunity while enjoying a tasty beverage. Charity auction gifts – perfect for finance and other companies that don’t have tangible or high demand products to donate. Blank Yeti Colsters start at $29.99. 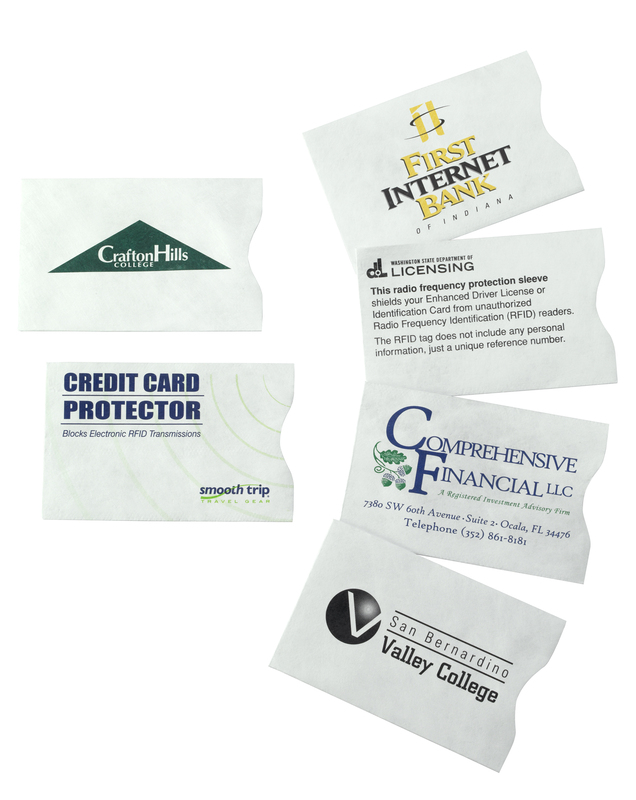 Contact us for custom pricing based on your logo size, and other customization. CEOpromos / CEOgolfshop minimum order is 24 units; order in 48 unit increments for faster production. We abide by all manufacturer price restrictions. Discounts are not allowed. For very large orders, we may be able to offer additional gift items. What colors can I print? Specify PMS colors for all art and we’ll try to match. It’s not possible to match every color, but we can usually get close. Can I use multiple colors? We’ll need to review art. Complex artwork will incur special set up charges. Are there size limitations? For the most cost effective solution, we recommend no larger than 1 inch wide by 3.25 inches from top to bottom. If you need wider, additional fees apply. What type of file is needed? Vector art. A transparent logo is required. .ai or .eps preferred. Custom RFID sleeves are an inexpensive promotional product with long life. 1 to 4 color messages on white looks great! It’s prime time for Identity theft opportunities from RFID chips. Block RFID readers from scanning your credit cards with custom Secure Sleeves®. Each time the card is used, your brand gets promoted. Secure Sleeves offer RFID protection for contactless credit and debit cards in YOUR wallet. Simply slide the card into the sleeve and the sleeve back into your wallet. It’s just that simple. Protect Passport Booklets and Passport Cards. Choose from a variety of styles. All are approved for protective use by the US Government. Market penetration is climbing for credit and debit cards with the little chips. The problem is thieves don’t even have to get that close to you if they have amped up equipment to read the data on the chip. 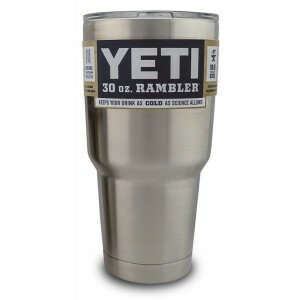 Yeti Rambler 30 digital proof, custom logo. 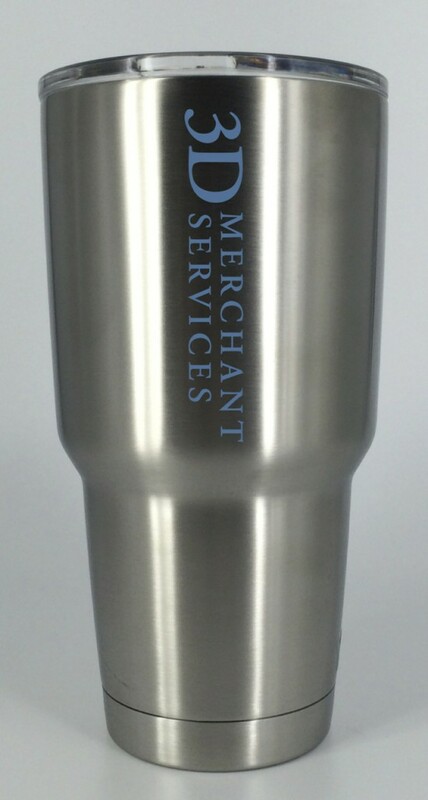 Yeti Rambler personalized with printed custom logo. The Yeti images above use one professionally shot Rambler and one shot with an iphone. Due to the product material, it’s very difficult to show how the logo looks. The proof is used to demonstrate position and fit, however, the marking color may vary from PMS specification to better present it. Can you personalize Yeti ramblers with a logo? Yes, we can do this. It’s not a traditional screen print. We use a laser marking process. Medical, aerospace, telecommunications, electronics and industrial firms use laser marking where permanent marking is required, such as for serialized parts. Where can you personalize? Currently we’re limited to the upper portion. Are there size limitations? We recommend no larger than 3.25 inches by 1 inch (as shown horizontally). What type of file is needed? Vector art. A transparent logo is required.